New attendance zones and student assignments. Check. Extended school year calendar. Check. In the 13 months after completing contentious, dragged out negotiations with Gov. John Carney and the state Department of Education, the Christina School District and its board of education have steadily made progress in checking off the milestones outlined in their Memorandum of Understanding (MOU) to reorganize schools and improve educational and other outcomes for children living in the Wilmington portion of the Christina district. “I think it has been going well. We have been able to do the things we needed to do,” Superintendent Rick Gregg says. Getting this far hasn’t been easy, Gregg admits, and while he says he’s “excited about the possibilities the plan presents for our children,” he acknowledges that the road ahead may not be as smooth as the one already traveled. Carney’s effort to improve Christina’s schools in Wilmington, which he described last week at a presentation by his Family Services Cabinet Council as “the worst performing in the state – by a lot,” began in the summer of 2017. Five months of negotiations involving his office, the Department of Education, Gregg, the Christina school board and the Christina Education Association produced the MOU, which aims to create enduring systems that improve learning opportunities, with much of that improvement coming through wraparound services that would benefit students and their families during the hours and days that they are not in school. Then, in September, the school board and the teachers union completed their negotiations on a separate MOU outlining planning and policies related to teachers in the Wilmington schools, who would be working for a longer school year. That set the stage for the key accomplishments of the fall and winter. Christina School District has created a new feeder pattern for its reorganized Wilmington schools. 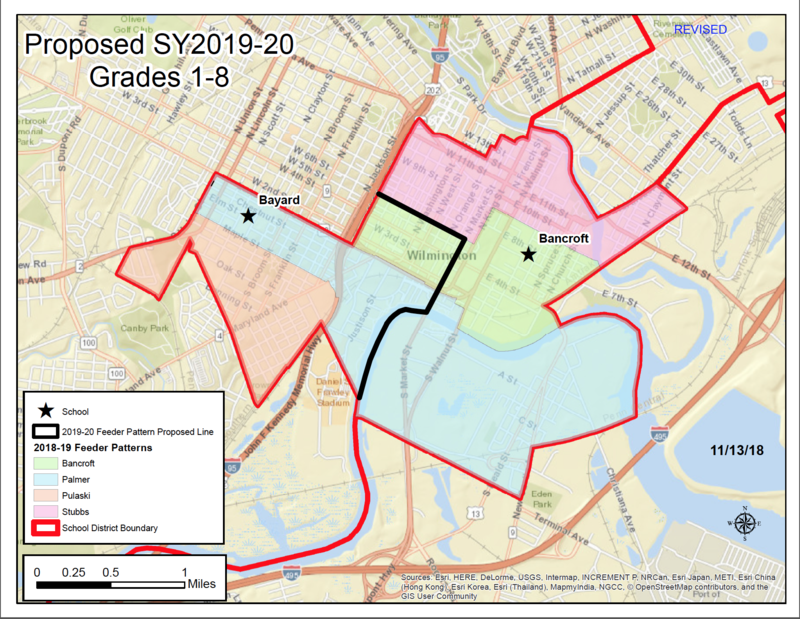 New attendance boundaries were established, with students in first through eighth grades assigned to either Bancroft School on the city’s East Side or Bayard School on the West Side, with kindergarten and prekindergarten programs consolidated at Stubbs Early Education Center, formerly called Stubbs Elementary, also on the East Side. As part of the plan, the Elbert-Palmer and Pulaski elementary schools will be closed at the end of the school year. Stubbs will become a “dual generation center,” with classrooms on the first floor and state-provided employment and adult education services on its upper level. A new school calendar was adopted for the Wilmington schools, adding 15 days of classes through an earlier start in August and a later close in June. The school day itself will remain at 7 hours, from 8:30 a.m. to 3:30 p.m., but additional after-school services are expected to be offered at all three buildings. New leaders have been named for the three schools. At Bancroft, Krystal Greenfield has been named campus leader, with Rella Reynolds in charge of the elementary grades and Jeffers Brown administering the secondary grades. At Bayard, Victoir Cahoon has been named campus leader, with Celeste Sosa-Vann heading the elementary grades and Vincent DeLillio heading the secondary grades. All six are currently administrators in the district. Whitney Williams has been named principal at Stubbs. She is currently supervisor of the Parents as Teachers early childhood home visitation program in New Castle County. As good as all those accomplishments may seem, what remains undone may prove even more daunting. Among the challenges ahead: The three buildings affected by the plan will need substantial renovations. None of the multiple agreements for planned wraparound services have been signed. The Department of Education administrator in charge of overseeing the project has taken a new job. And the Christina district has scheduled a tax-increase referendum for April 30, with its outcome threatening to exacerbate the city-suburb divisions that have tormented the district since its creation in 1981. Bayard Middle School, along with Bancroft Elementary, is scheduled to house 1st through 8th grades starting next year. Bayard, now a middle school, and Bancroft, once a middle school and now serving prekindergarten through fifth grade, will require significant renovations to accommodate the new grades 1-8 configuration. So will Stubbs, now serving kindergarten through fifth grade, as its upper level will require a redesign to serve an adult clientele. Improved security measures, both for entrances and exits and to separate students of different grade levels, are also part of the plans. The state has committed $15 million to the renovations and the district $2.5 million, but the architects have not provided cost estimates yet, Gregg says. Based on a presentation the architects gave at a January school board meeting, board member John Young believes the estimates will exceed the amount the state and the district have committed. “It’s not even close,” he says. Further complicating the issue is that the work cannot be completed during the two-month summer break. Under the new calendar for the three schools, teachers return to work Aug. 5 and classes begin a week later. Some students will be attending classes in “swing spaces,” areas in their buildings where work is not in progress, until the renovations are complete, Gregg says. Dorrell Green (right) has stepped down as head of the DE Dept. of Education's head of the Department of Education’s Office of Innovation and Improvement to become superintendent of the Red Clay Consolidated School District. However, Gregg says, none of the agreements for these services have been signed. 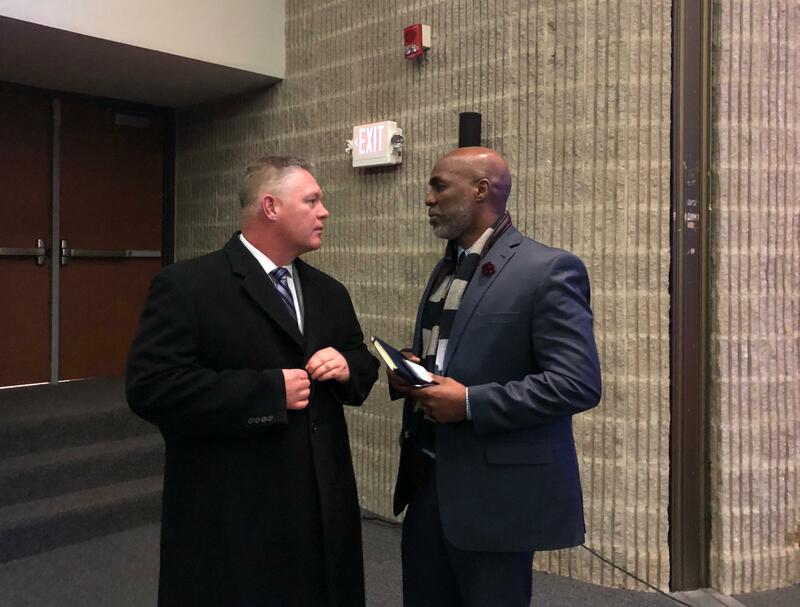 Many of the arrangements have been handled primarily by the state, and Dorrell Green, who led the state’s effort as head of the Department of Education’s Office of Innovation and Improvement, left that position on March 15 to become superintendent of the Red Clay Consolidated School District. Several state education administrators are now sharing Green’s former duties and the vacancy will be filled “as quickly as possible following the typical HR process,” DOE spokesperson Alison May said. She said the department, as well as the other agencies represented in Carney’s Family Services Cabinet Council, are continuing to work with each other and with the district to develop the supports that will be needed by the families that are expected to access the dual generation center at Stubbs. The department “will coordinate resources with the other state agencies to integrate services,” she said. As for the cost of the expanded services, May said Christina also has access to other state funds in addition to the $1.5 million already committed. Several of Christina’s current nonprofit partners, including the United Way of Delaware, Get Delaware Reading (Wilmington) and Children and Families First, will continue to provide resources and additional funding will be sought from Delaware’s philanthropic community, she said. Layering Green’s departure on top of the construction delays and the incomplete agreements on wraparound services indicates that “the partnership seems to have become a little frayed,” Young says. Lurking in the background, but soon to take center stage, is an issue that threatens to reignite the anti-Wilmington sentiment that has prevailed for nearly 40 years in suburban portions of the district. The district has scheduled a referendum on April 30 for a tax increase to support school operations – 24 cents per $100 of assessed valuation for the coming school year and five-cent increases in each of the two succeeding years. For the average home in the district – one with an assessed value of $64,100 – the tax increase would be about $218, or nearly $18 a month, in the third year. Most of the increased revenue that a successful referendum would generate – nearly $19 million a year after three years – would cover increasing costs, with some going to improve the district’s share of salaries and benefits and some to support a proposed school of the arts within Newark High School. “We need the referendum. We need the support of the community” to support current operating levels, Gregg says. The primary challenge here is that Delaware voters – in Christina and elsewhere – have a tradition of rejecting tax increases the first time they’re proposed by a school district. In the last two months, voters in the Indian River and Woodbridge districts have turned down proposed tax hikes. Doubling the pressure on Christina is the reality that, if the referendum fails, the district won’t have time for a second try before it has to notify New Castle County of its final tax rate for next year. But the greater consequence, Young and Gregg note, lies in where the impact of a failed referendum will be felt the most. “If it fails, it could cost us 80 to 100 teachers,” Young says. Because the MOU between the district and the teachers’ union gives added protections to teachers assigned to Bayard, Bancroft and Stubbs, “those cuts will be in suburban schools,” he says. “Wilmington schools would be in a better position” because of the commitments made to the teachers who have chosen to work there, Gregg says. In this scenario, Young envisions a dual backlash: anger within the union among suburban teachers whose jobs would be threatened and anger among suburban parents whose neighborhood schools would likely feel the greatest impact of any cutbacks. Such an outcome could renew resentments that have smoldered since court-ordered desegregation in 1978 resulted in busing Wilmington students to schools in Newark, Bear, Christiana and Glasgow for up to nine years and suburban students to Wilmington for three years. While the busing requirements have since changed, the district’s only high schools are in the suburbs. In Young’s view, however, the state, especially the Department of Education, shares some of the blame for negative public attitudes and failed referenda. “The state has spent the better part of the last 20 years testing and labeling our schools as ‘failure factories,’” a theme Carney reprised last week, Young says. Passage of the referendum would smooth the way for a better launch of the reorganized Wilmington schools, Gregg and Young say. But the remaining obstacles are still a cause for concern.